This place is almost a must stop after going all the way to Delaware to visit the Brewery itself. Just like at the brewery, the selection is sizeable and the beers are really great across the board. There's a long bar, and it was completely full, although it wasn't too difficult to get a drink. We put our names in for a table, and then when wandering around realized that there were tables outside that you had to separately put your name in for. I put my name in at both and went with the one that called me first. It was a bit odd that there wasn't just one server's station where you can try to get any table. Also, there aren't nearly enough bathrooms. The main floor has 3 single person bathrooms, and the line outside of them was always several people deep. The food was ok, but it's clearly not the reason they exist. Without the beer, the food is just average. 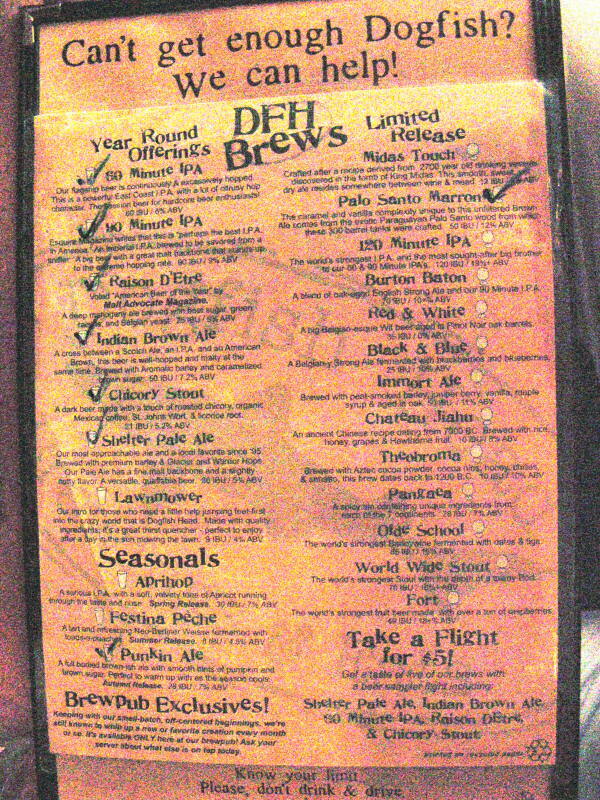 My friends and I planned a pre-New Year's Eve 2009 trip up to Rehoboth Beach to check out the Dogfish Head brewpub. Overall, we had a great time and enjoyed ourselves immensely. After being seated near the door on a very cold day in late December, the wait staff tried to accommodate us at a warmer table, but in the end, we decided to stick it out. They were very friendly and helpful. We got our first round of beers, and felt comfortable leaving coats and table unattended while we went on a tour of the facility. The head distiller was knowledgeable and answered all of our questions. She took her time and didn't rush the tour, but kept it lively and interesting. Once back at our table, we had lots of beers to try. 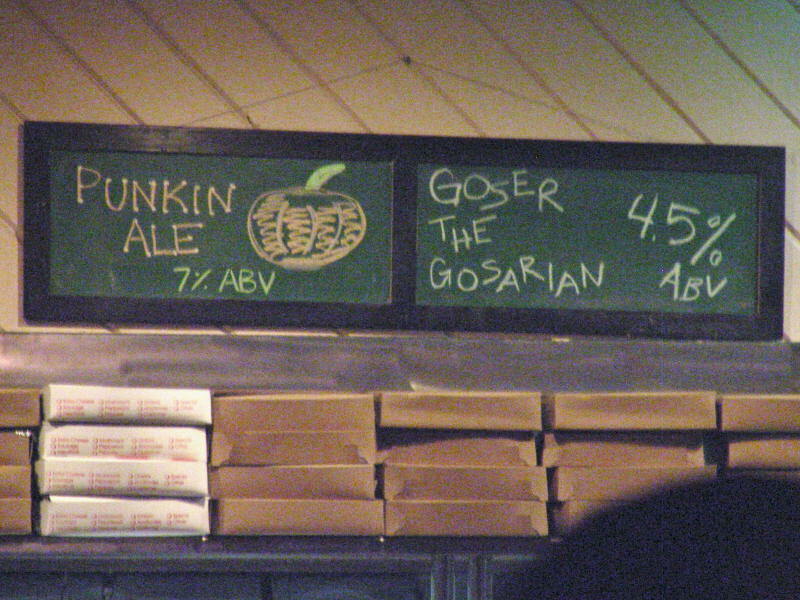 The beers that were available on draft and by the bottle were clearly marked on the menu, making choices easier. There was a large variety to be had, and with 8 people at the table, I think we tried just about everything. We even sampled some of the spirits, of which I had previous been unaware. One of the highlights for me was the Pangaea, a very earthy, almost dirt and mushroomy beer. We also enjoyed the Burton Baton, dark and sweet but with good hop character. All the usual beers were there, and good as ever. Food seemed like a good idea, and we ordered up a bunch of stuff. All of it came out quick and warm, and all of it was tasty. At one point, we noticed some weird bugs coming out of the parmesan shaker and we notified the server. The brewpub staff took care of the situation immediately, apologizing profusely and even lowering the total of our bill substantially. We were most pleased. All in all, the beers, service, and atmosphere were excellent. I'd go back in a heartbeat if it weren't such a trek to get there. 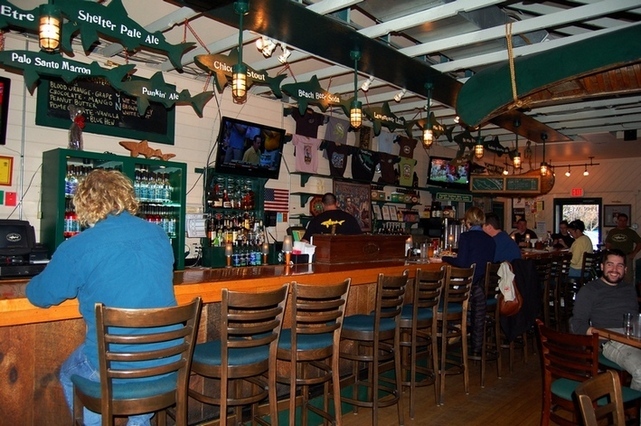 Great atmosphere with awesome selection of standard and seasonal dogfish beers, brewpub exclusive beers, and spirits (rum, gin, vodka, and rum and vodka infusions) made in the distillery on the second floor of the restaurant. This year they have also added a cask ale tap with different Dogfish beers rotating through it. 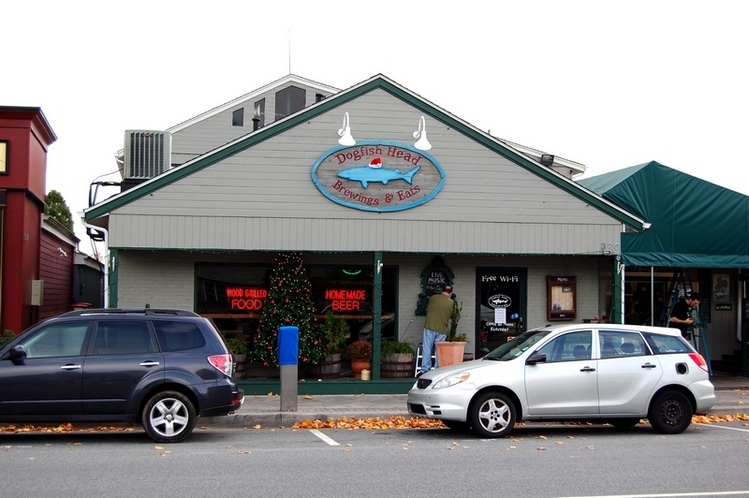 The restaurant commonly has over 10 dogfish beers to choose from. And they have great woodgrilled food, winter food specials and beer dinners. I went to the Rehoboth brewpub after a brewery tour in Milton and parking was easy right out front (on a Friday afternoon). I sat at the bar as it wasn't crowded, and I have to say the bartender was not at all attentive. I had to constantly flag him down and his attitude was clearly one of indifference. The service was clearly the worst thing about the experience...I'd fire staff that don't even smile. But on Fridays, they bring out 'Randall the Enamel Animal', an interesting device that they dryhop/filter their 'Alehouse 75' IPA through (a blend of their 60 and 90 min IPA). It was wonderfully aromatic and delicious. I also tried a sampler of their own distilled spirits (rums, vodkas and gin), and they were very good. I wasn't able to do a tour sadly, but I'm sure it would be cool to see their distillery and the original brewery in action. I didn't eat much for food, but I've never had anything bad thus far at any DFH Alehouse or establishment. They have a large selection of food to choose from (and pairs nicely with various beers). Before I left, I bought a few rare beers out of their vintage beer cooler (they only had three choices, each only in a 12 oz bottle, which was a bit too pricey if you ask me). Just finished a tour at the Brewery so I thought I had to visit the birth place of Dogfish. The place was bustling and instead of waiting for a table I chose to sit at the bar. Nice looking place and afterward realized sitting outside would have been a great choice too. I ordered a sampler, couldn't get it until I said the term they use - fish something or other. As expected, I enjoyed the beer. I ordered a turkey burger with mushrooms on a kaiser and soup - mushroom and potatoe. The soup was ok but luke warm. The burger was good but the mushrooms didn't seem delighted to be there. The fries had the taste of the frozen ones I had as a youth - not a fond memory. Overall the food was less than stellar. The bartendar was just there - no "off-centered" enthusiasm as I was to expect. To be fair, it did seem busy. As I said, I had the sampler and enjoyed the beer. Decided on my current favorite anyway - 60 minute. What a great beer. The beer selection on tap was less than I thought it would be though and asked for brewpub exclusives and the bartender said there wasn't any. I guess I was expecting a larger variety. Overall the session was ok, but I was expecting much more. I had read and enjoyed Sam's book and a constant buyer of the 60 minute and so was really hyped to experience the place. I'm not saying it was bad, just not up to my self hightened expectations. What can you say about DFH that hasn't already been said? Started with a 90 minute IPA, which is pretty much my "gold standard". Then came dinner, a pretty decent spicy gumbo, along with another 90. For dessert I had a 120 minute IPA, draught, which I absolutely savored. If my GF hadn't been feeling under the weather that day, I wouldn't have stopped at one. The staff was very friendly and helpful and gave me a nice sample of the Palo Santo Marron, which did not really suit me but I drank it anyways. Waste not, want not! Definitely a top-notch establishment and I look forward to a trip to the Milton facility. We hit the brewpub on our vacation with friends last summer, so pardon the cloudy memory if that gets noticeable. What is clear is that both the food and the beer were excellent. I had a pizza of some sort, which was terrific. Everyone at our table, 4 adults and 5 children, went home happily stuffed. With the happiness shining upon us, we had the opportunity to drink what must have been the test batches of the Red and White and Black and Blue. I expected to like the B&B better, but was dead wrong. To me it lacked the pizzazz I expected from this brewery. The R&W, however, was very cool. Actually, it was a little hot, its only flaw. 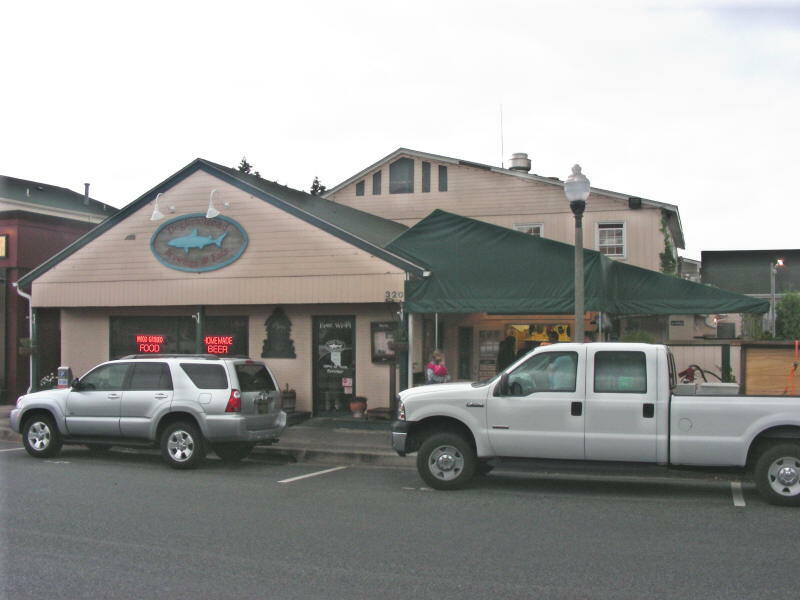 The atmosphere was a busy, bustling Dogfish Head, crowded, laid-back and happy. Like me. Our waitress did a good job, though new less about the beers than I expected. Sold us a World Wide Stout (I forget which year) for $20, which is what we paid for a growler of Midas Touch. I'll guard that growler with my life. Seemed a little spendy, but what did I expect? And it was filled with the ancient nectar, one of my favorites, so I'll live with it. Good stuff, and a must-stop in the world of American beer. This is a really good brewpub. We went for lunch on a Saturday and the food, service and beer were all outstanding. They had about a dozen of their beers on tap and cooler full of "vintage" aged ales as well. We got a sampler of 5 of their beers and all were good. I had a pint of the Aprihop Ale, an apricot pale ale similar to Magic Hat #9 and one of the 90 Minute IPA. The 90 Min was one of the best American IPAs I have ever had, very hoppy but with a solid malt base to balance it. 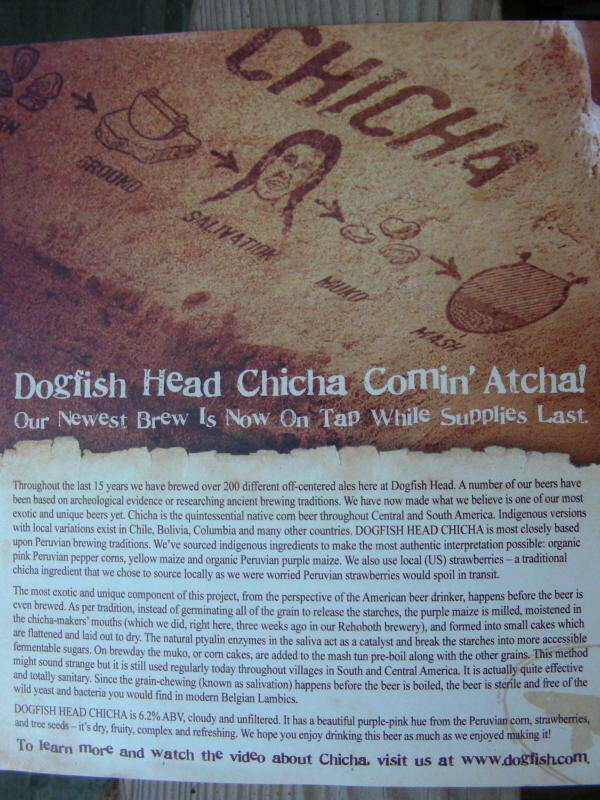 If you are ever in the Rehoboth Beach are I would highly reccomend a visit to Dogfish Head.